Does The Oldest Temple Topple Evolutionists’ History of Religion? Ordinarily I give posts from the Institute of Creation Research (ICR) a wide birth because there is already a fine blog dedicated to commenting on what they have to say. Their latest post, however, requires comment. Mostly because they mentioned evolutionary anthropology by name (and as an egotistical male, I take any critique of my subject as a direct attack on me). But before I defend myself, some background. Göbekli Tepe is the oldest religious structure found so far, consisting of massive stone pillars, engraved with many kinds of animals. The complex would’ve required extensive co-ordination and effort to construct. It has been placed in the pre-pottery Neolithic A period (around 12,500-9,000 year ago, depending on who you ask) based upon the artefacts found there. These dates have been further refined via radiometric dating (including U-series & c-14) to around 12,000 years ago. This places it around, if slightly before, the advent of agriculture, suggesting those who made the structure were hunter-gatherers, but don’t be fooled, these weren’t simple tribesmen. As the nearby city of Jeriocho (also from PPNA) indicates, they were beginning to settle down into large cities despite being still reliant on the land which might explain how they were able to co-ordinate the construction of such structures. 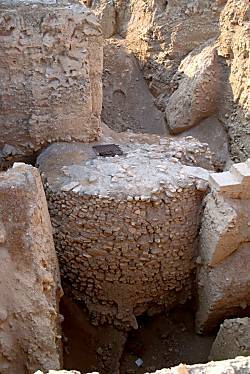 the [commonly accepted] idea that agricultural amenities spawned religion is making an about-face in light of the fully constructed temple complexes discovered at Gobekli Tepe…the remarkable findings there show that mankind was able to worship from the beginning of the human race. But supports their view of the history of humanity. But does the world’s oldest temple actually refute evolution and vindicate creationism? Well, the first problem with what they’re saying is contained within that question. All their arguments are predicated on it being “the world’s oldest known temple” but, as I’ve mentioned, this has been determined via archaeological association and radiometric dating, two techniques that creationists readily deny. So how do they know it’s the oldest? As far as I can tell, they can’t. The closest any come to dating it scientifically creationifically is the source article in which a reader notes it must be from after the great flood since it isn’t covered with a lot of sedimentary rock. But do they get from “post-flood” to “oldest temple?” Nope. Okay, so maybe they’re arguing within the evolutionists’ paradigm, granting its assumptions and going from there. Well, they might be but if that’s the case, their conclusion about how this find vindicates Biblical history is invalid. That argument isn’t within the evolutionary paradigm, that argument isn’t assuming radiometric dating to be correct and so that argument is unsupported. The ICR has knocked the support for their claim out from under them. But will they remember to fall? But what “evolution-inspired claims” are they talking about? That might seem like a fairly banal question, so let me clarify with two tales. Homo sapiens emerged from the hominin lineage (which split from chimps 5-7 million years ago) 190,000 years ago. Since then we’ve remained pretty much unchanged. Some suggest there was a mutation 50,000 or 10,000 years ago that allowed us to become smarter and engage in “modern” behaviour but these claims have been pretty much refuted. Around 100,000 years ago people started to bury their dead, suggesting they had some kind of belief in the afterlife. Meanwhile we produced half man/half beast sculptures around 30,000 years ago indicating we contained a fantasy element – perhaps even a religious one. As communities grew with the advent of agriculture and became more organised, these early religions did as well, becoming organised religion. Two different stories, both containing the word “evolution.” Which does the ICR dispute here? Common sense dictates the second and they do appear to argue against it. Religion supposedly emerged after the development of agriculture provided people with enough free time and close proximity to bicker, thus also providing them with an incentive to invent God and religion. But at the same time they make claims pertaining to biological evolution. The remarkable findings there show that mankind was able to worship from the beginning of the human race…The earliest humans were every bit as smart and able as modern ones….with all the faculties necessary to imagine, build, farm, and worship. The implication here being that evolutionary anthropology argues religion is contingent upon some biological ability that recently evolved; that there was some additional faculty which we developed, made us smarter than our ancestors and able to produce religion. Yet, as I mentioned above, there has been no such recent mutation. No new traits appear to have developed since our species appeared 190,000 years ago and so showing we made temples 12,000 years ago doesn’t undermine the standard explanation. But let’s give them the benefit of the doubt and presume they’re only critiquing the evolution of religion. Does Göbekli Tepe refute the story? Not really, it requires that it be changed slightly to suggest it was becoming sedentary and not agriculture that led to the organisation, which in turn prompted religion. However, as Jericho indicates, we already knew people were becoming sedentary prior to agriculture so it’s ultimately just pointing out these pre-agricultural communities could’ve also been organised. This kind of plays on what we mentioned about the idea that many people think that hunter-gatherers were, whilst in tune with nature, idiotic brutes. Is there no possibility of us being wrong about the transcendence to agricultural revolution? Ultimately pinpointing the exact origin of agriculture is difficult, so it is possible that the PPNA people did actually have it. Although even if they did not, given how close in time it is to the accepted invention of farming it is likely they were at least in the process of developing it and it might be the increased food production associated with slowly inventing agriculture that permitted the large populations found at Jericho etc. That said, agriculture wouldn’t be required for such large settlements. Lepenski Vir is a site on the Danube that shows hunter-gatherers will live in large, permanent “cities” if there is enough food in the area (in this case from the river). The fact that they will intensively exploit the land in this manner further shows they were indeed non living “in-tune” with the environment and is also a testament to their ingenuity and shows they weren’t savages either. I always thought the first settlements were in the fertile crescent due to agricultural purposes. There have been some who suggested that humans underwent a cognitive “revolution” ~50,000 years ago. This, they posit, explains the sudden appearence of the Upper Palaeolithic around this time, with its novel technologies and behaviours. However, as archaeologists have been exploring Africa more thoroughly it has been discovered that many of these Upper Palaeolithic inventions actually developed more gradually from ~110,000 years ago onwards. There was no sudden revolution and thus likely no significant cognitive change. I’ve heard that it can be difficult to gauge the technology of early Africa, since a primary building material would have been wood. And as you point out in several posts, behaviors don’t preserve well. Ever since high school, when I realized that the gags in ancient Greek comedies still made me laugh, I’ve understood how little we’ve really changed. I’m enjoying your blog very much, BTW! Certainly that is the case, but once stone tools are invented ~2.6 mya the record improves muchly. Thus when examining developments 110 kya I was talking about we have a good idea of what is going on. Granted it is incomplete, given we still lack biodegradable tools, but it’s still pretty decent. Indignant opinions can be the best ones, especially about Star Trek! I hadn’t realized the difference was so large with stone tools. That’s one reason I’m enjoying the blog. Not an area of science I’ve had a chance to explore!